Painting of Sayat Nova by artist Mary Zakarian. 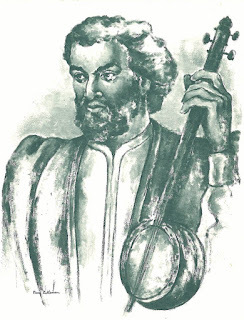 Thanks to Gevorg Akhverdian, Sayat Nova’s research and preservation of Armenian folk music came to light fifty years after the troubador’s death. In 1795 a priest called Der Stepanos was killed in Tiflis during an attack by Persian forces. He was actually Sayat Nova (1722-1795), the greatest Armenian troubadour, who had been forced by King Irakli II of Georgia to become a priest more than three decades before. His name and work remained in total obscurity until another native of Tiflis, Gevorg Akhverdian, would come to his rescue more than a half a century after his death. Akhverdian was born on June 5, 1818, in the family of an officer of the Russian army. He graduated from the Lazarian lyceum of Moscow in 1834 and five years later he finished the medical school of the University of Moscow. He returned to the Caucasus, where he was an army doctor from 1839-1842. After a stint of four years as personal doctor for War Minister Chernishev in St. Petersburg (1842-1846), he came back to Tiflis as employee for the office of the viceroy of the Caucasus. Akhverdian was not a simple doctor, but his intellectual interests were much wider. He discovered the “Letter of Thrones” (Kahnamag/Գահնամակ), a document from the time of the Armenian kingdom, which established the order of hierarchy of the nobility. He participated in a project of gold mining for the Caucasian region and was also the head of the Armenian department of the committee that supervised the production of textbooks for the Caucasus. He also wrote a study on the guilds of Tiflis. However, his major contribution to Armenian literature was the collection of works by Armenian troubadours. He discovered Sayat Nova’s handwritten collection of poems (called Davtar/Դաւթար) in three languages, kept at the library of a colleague, which contained 46 Armenian songs (written in Georgian characters), 114 Turkish songs (written in Armenian characters), and a few Georgian songs. He devoted himself to its deciphering and publication. The collection of Sayat Nova’s songs was first printed in 1852. Akhverdian annotated the songs with explanations about many words that were difficult to understand to the reader. He also included a special study of the Tiflis dialect, which was necessary to understand Sayat Nova’s language and became the foundational pillar of Armenian dialectology. The second volume of his collection of songs by Armenian troubadours was published by his daughter Mane Akhverdian half a century after his death (1903). Gevorg Akhverdian wrote a study on the history of Georgia based on Armenian sources, which remained unpublished. He passed away on November 17, 1861, in Tiflis, at the age of 43.